Circuitech has invested a considerable amount of time and resources over the past years in establishing itself as the preeminent repair/refurbishment facility on the 7000/8000 line of Fujitsu ATM parts. This allows us to continue supporting these ATM parts until end of life, whereas most repair organizations have allowed their Fujitsu capabilities to fall by the wayside. We continue to support the Fujitsu ATM components, giving us an excellent advantage in supporting the same Fujitsu 8000 Series parts used in the OEM ATM market and the KIOSK market. This repair capability extends specifically to the repair/refurbishment of F50, F53, F56, F100, F400, F510/610 dispensers and the depository line used in non-ATM applications. 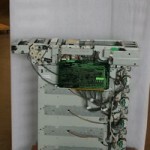 Please feel free to contact us with any Fujitsu part repair question that you may have.